A sterling collection of short stories from the author of Rule of the Bone and The Sweet Hereafter--his first in almost fifteen years--including six never-before-published works. 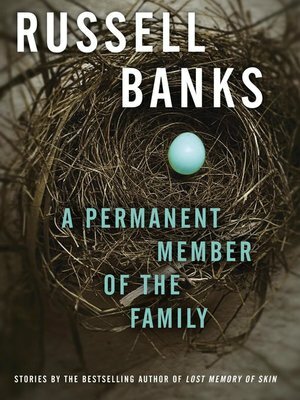 One of our most prestigious writers, Russell Banks is a literary icon whose works probe the recesses of the human condition. His novels and stories offer rich portraits that are profound and deeply resonant--appearing regularly in anthologies and collections such as The Best American Short Stories and The PEN/O. Henry Prize Stories. This collection of twelve short works showcases this master at the peak of his intuitive powers. As he did in such works as the classic The Sweet Hereafter, the revered Rule of the Bone, and the haunting Lost Memory of Skin, Banks limns provocative and morally complex themes with pathos and sharp insight. Each of the stories in this powerful collection demonstrates the range and virtuosity of his narrative prowess and startlingly panoramic vision. A Permanent Member of the Family is a stunning addition to the canon of a writer "whose great works resonate with such heart and soul" (Janet Maslin, The New York Times).